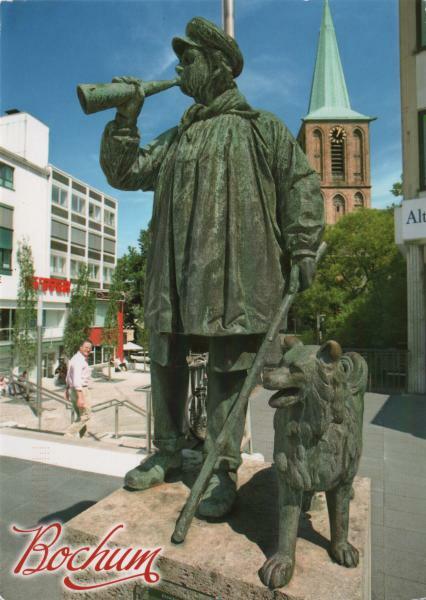 Fritz Kortebusch was the last cowherd in Bochum town in the Westfalia, Germany. Every day from 1850 to 1877 he drove the cattle or other animals belonging to the townspeople to the common land. At that time almost every family would have owned a goat and/or a cow. The first memorial to Fritz Kortebusch was put up in 1908 but it was melted down during WWII. It was replaced in 1962 and now stands where the former town hall, market place and pillory used to be. the old common land is now the Bochum Stadtpark, after Essen, the oldest communal park in the area which opened in 1878. Wasn’t he in the Sound of Music? Oh no, hang on that was a Lonely Goatherd! I am glad they decided to put it back in place.